Schiaparelli EDM lander [skjapaˈɾɛlːi] was the Entry, Descent and Landing Demonstrator Module (EDM) of the ExoMars programme—a joint mission of the European Space Agency (ESA) and the Russian space agency Roscosmos. It was built in Italy and was intended to test technology for future soft landings on the surface of Mars. It also had a limited but focused science payload that would have measured atmospheric electricity on Mars and local meteorological conditions. Launched together with the ExoMars Trace Gas Orbiter (TGO) on 14 March 2016, Schiaparelli attempted a landing on 19 October 2016. Telemetry signals from Schiaparelli, monitored in real time by the Giant Metrewave Radio Telescope in India (and confirmed by Mars Express), were lost about one minute from the surface during the final landing stages. On 21 October 2016, NASA released an image by the Mars Reconnaissance Orbiter showing what appears to be the lander's crash site. The telemetry data accumulated by the TGO and ESA's Mars Express orbiters are being used to investigate the failure modes of the landing technology employed. The Schiaparelli Entry, Descent, and Landing Demonstrator module is named for Giovanni Schiaparelli (1835–1910), an astronomer active in the 19th century who made Mars observations. In particular, he recorded features he called canali in his native Italian. His observations of what translates as channels in English inspired many. The dark streaks on Mars are an albedo feature which is related to dust distribution; these albedo features on Mars slowly change over time, and in the last few decades have been monitored by Mars orbiters. Schiaparelli is famous for making hand-drawn maps of Mars during its 1877 oppositions with Earth with an optical refracting telescope. He was also the first astronomer to determine the relationship between comet debris and yearly meteor showers. Other things named for Schiaparelli include the main-belt asteroid 4062 Schiaparelli, named on 15 September 1989 (M.P.C. 15090), the lunar crater Schiaparelli, the Martian crater Schiaparelli, Schiaparelli Dorsum on Mercury, and the 2016 ExoMars EDM lander. The mission was named in November 2013; previously it was known as the Exomars Entry, descent and landing Demonstrator Module, or ExoMars EDM for short. Another name was ExoMars static lander, however some designs for what was the static lander are quite different due to various stages of design and program restructuring. Another name, especially for both orbiter and lander together is ExoMars 2016. This space art, titled The Next Stop was selected by the ESA when discussing its Aurora flagship ExoMars program, and features people enduring a Mars dust storm near a manned Mars rover. The ExoMars scientific objectives are: the search for traces of past and present life; the characterization of the water/geochemical environment as a function of depth in the shallow subsurface; the study of the surface environment and identification of hazards to future human missions; and finally, the investigation of the planet’s subsurface and deep interior, to better understand the evolution and habitability of Mars. An important date in its development was 2005, when the ESA council approved 650 million Euros for a Mars rover and static lander. At this time the idea was for a single launch bringing both a Mars Exploration Rover class rover and instrumented static lander to Mars with a simpler cruise stage;in this case the static lander both landed the rover and performed its own studies. However to accomplish its mission goals within the constraints of a Soyuz launcher, the rover was budgeted for 6 kg at one point. This led to the search for bigger rockets; the Ariane V, Atlas V, and Proton were evaluated. As heavier launchers were considered, heavier rovers from 180 even up to 600 kg were considered, and eventually the idea of test lander to offload risk from the rover lander was taken seriously and fit well with a two launch setup that allowed for a heavier orbiter and a heavier rover. Another factor was if the demonstrator should wait in Mars orbit for the Global dust storm to start. Early in the development, the idea was for the lander to be carried by a dedicated cruise stage called the Carrier Module. Eventually, the Trace Gas Orbiter mission was merged into ExoMars becoming the mother-ship for the EDM. An older iteration of the static lander was planned to carry a group of eleven instruments collectively called the "Humboldt payload", that would be dedicated to investigate the geophysics of the deep interior. But a payload confirmation review in the first quarter of 2009 resulted in a severe de-scope of the lander's instruments, and the Humboldt suite was cancelled. Notional instruments in the Humboldt payload included a sub-surface radar, meteorological instruments, and the geophysical instruments. 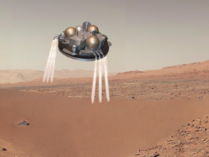 The data obtained from Schiaparelli are expected to provide ESA and Roscosmos with the technology for landing on the surface of Mars with a controlled soft landing, key technologies for the 2020 ExoMars rover mission. The 577 kg (1,272 lb) descent module Schiaparelli and orbiter completed testing and were integrated to a Proton-M rocket at the Baikonur cosmodrome in Baikonur in mid-January 2016. TGO and EDM arrived at Baikonur in December 2015. In February the spacecraft was mounted to the Briz-M upper stage, and in early March that was attached to the Proton rocket. The launch occurred at 09:31 GMT (15:31 local time) on 14 March 2016. Four rocket burns occurred in the following 10 hours before the descent module and orbiter were released. A signal from the orbiter was received at 21:29 GMT that day, confirming that the launch was successful and the spacecraft was functioning properly. Shortly after separation from the probes, the Briz-M upper booster stage exploded a few kilometres away, without damaging the orbiter or lander. After its launch, the Trace Gas Orbiter and EDM traveled together coasting through space towards Mars. During this time the EDM was powered from an umbilical power line to the TGO, thus preserving the EDM's limited internal batteries. On 14 October 2016, the TGO did a final adjustment to its trajectory before the separation of Schiaparelli. The launch mass of the two spacecraft together is 4332 kg including the 600 kg Schiaparelli module. This was the heaviest spacecraft yet sent to Mars. The journey from Earth to Mars in 2016 took about 7 months. On 16 October 2016, the TGO and EDM separated, the orbiter heading for Mars orbit insertion and the EDM for Mars atmospheric entry. Prior to the separation, the EDM was spun up 2.5 RPM (see also spin stabilization) and then released at a velocity of about 1 km/h relative to TGO. The EDM was designed to go into a lower-power hibernation mode for about 3 days while it traveled solo to Mars. The EDM came out of hibernation about an hour and a half prior to reaching the Martian atmosphere. Meanwhile, after the separation, the TGO adjusted its trajectory for its Mars orbit insertion and by 19 October 2016 performed a 139-minute rocket engine burn to enter Mars orbit. On the same day, the Schiaparelli module arrived at Mars traveling at 21,000 km/h (13,000 mph; 5.8 km/s) and engaged in its prime task of entry, descent, and landing. It used a heat shield, parachute and retrorockets to slow its descent. The TGO entered Mars' orbit and it will undergo several months of aerobraking to adjust its speed and orbit, with science activities beginning in late 2017. The TGO will continue serving as a relay satellite for future Mars landing missions until 2022. 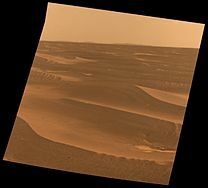 View of Meridiani Planum by the Opportunity rover in 2004, an area favored by probe landings for its smooth dunes and mostly boulder-free plains. The landing site chosen was Meridiani Planum, a Martian plain prized by Mars landers for its flat terrain and low elevation that gives a spacecraft time and distance to slow down before reaching the ground. The EDM cannot avoid obstacles during its descent, so it was important to pick a large flat area with a minimum of obstacles. 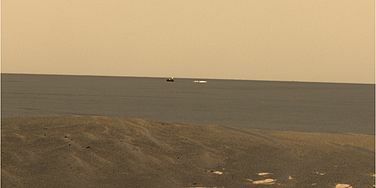 The landing ellipse is about 100 km long by 15 km wide, centered at 6° West and 2° South running East-West, with the eastern edge including the Opportunity rover landing site, and near Endeavour crater where it was still operating when the EDM was launched and when it attempted to land. The Opportunity rover (MER-B) landing site is called the Challenger Memorial Station. It was also thought that the EDM would have a chance of arriving when Mars experienced its global dust storms, and thus gain knowledge about the atmosphere under these less common conditions. The site is also known to be scientifically interesting; The Opportunity rover discovered a type of iron mineral that forms in the presence of water, so it is theorized there was a significant amount of water there in the past. 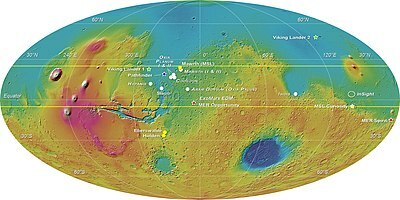 The red star denotes the planned landing site for the ExoMars Schiaparelli EDM lander: Meridiani Planum, close to where the Opportunity rover landed in 2004. The landing was planned to take place on Meridiani Planum during the dust storm season, which would have provided a chance to characterise a dust-loaded atmosphere during entry and descent, measure the dust's static electricity charge —typically produced by friction— and to conduct surface measurements associated with a dust-rich environment. Time-lapse composite of the Martian horizon over 30 Martian days shows how much sunlight the July 2007 dust storms blocked; Tau of 4.7 indicates 99% sunlight blocked. Global dust storms have occurred at least nine times since 1924 including 1977, 1982, 1994, 2001 and 2007; the 2007 dust storms nearly ended the functioning of the solar-powered U.S. Mars Exploration Rovers Spirit and Opportunity. Global dust storms obscured Mars when the Mariner 9 orbiter arrived there in 1971, and it took several weeks for the dust to settle down and allow for clear imaging of the surface of Mars. It was predicted that Mars global dust storms are likely to occur in the fall of 2016, but they had not started when the EDM attempted its landing. Here is the MSL entry vehicle during the parachute phase of its descent. Schiaparelli was designed to deploy its parachute at 11 km above Mars. Here is the MSL entry vehicle ejecting its heat shield over Mars. Schiaparelli was designed to eject its lower heat shield at an altitude of 7 km above Mars. The Schiaparelli lander separated from the TGO orbiter on 16 October 2016, three days before arrival at Mars, and entered the atmosphere at 21,000 km/h (13,000 mph) on 19 October 2016. (see also Mars atmospheric entry) When the lander disconnected from the orbiter, it switched to internal battery power and used a low-power hibernation mode while it coasted for three days just before entering the Martian atmosphere. Schiaparelli came out of hibernation several hours before its entry, at a speed of 21,000 km/h (13,000 mph) and an altitude of 122.5 km (76.1 mi) above the surface of Mars. The heat shield was used during the plunge into the atmosphere to decelerate the lander to 1,650 km/h (1,030 mph) by the time it reached 11 km (6.8 mi) altitude. During entry the COMARS+ instrumentation the EDM operated to collect data on how heat and air flow around the entry capsule. After slowing its initial entry through the atmosphere, the module deployed a parachute and was to complete its landing on retrorockets by using a closed-loop guidance, navigation and control system based on a Doppler radar altimeter sensor, and on-board inertial measurement units. Throughout the descent, various sensors recorded a number of atmospheric parameters and lander performance. The plan was that at 7 km (4.3 mi) in altitude the front heat shield would be jettisoned and the radar altimeter turned on, then at 1.3 km (0.81 mi) altitude above Mars the rear heat cover and parachute would be jettisoned. The final stages of the landing were to be performed using pulse-firing liquid-fuel engines or retrorockets. About two metres above ground, the engines were designed to turn off and let the platform land on a crushable structure, designed to deform and absorb the final touchdown impact. On final landing it was designed to endure rocks about one foot high, and it was hoped, but not guaranteed, that no out-sized boulders or craters would be encountered. On final contact, the lander was designed to handle slopes of up to 19 degrees and rocks up to 38 cm (15 in) in height. Contact was lost with the module 50 seconds before the planned touch-down. By 21 October 2016, after studying the data, ESA said it was likely that things went wrong when the parachute released early, the engines then turned on but then turned off after too short of time. The Schiaparelli lander attempted an automated landing on 19 October 2016, but the signal was unexpectedly lost a short time before the planned landing time. ESA's Mars Express and NASA's Mars Reconnaissance Orbiter (MRO) and MAVEN continued listening for the lander's signal to no avail. Schiaparelli transmitted about 600 megabytes of telemetry during its landing attempt, and detailed analysis found that its atmospheric entry occurred normally, with the parachute deploying at 12 km (7.5 mi) and 1,730 km/h (1,070 mph), and its heat shield releasing at 7.8 km (4.8 mi). However, the lander's inertial measurement unit, which measures rotation, became saturated (unable to take higher readings) for about one second. This saturation, coupled with data from the navigation computer, generated an altitude reading that was negative, or below ground level. This caused the premature release of the parachute and back shell. The braking thrusters then fired for about three seconds rather than the expected 30 seconds, followed by the activation of ground systems as if the vehicle had already landed. In reality, it was still at an altitude of 3.7 km (2.3 mi). The lander continued transmitting for 19 seconds after the thrusters cut off; the loss of signal occurred 50 seconds before it was supposed to land. Schiaparelli impacted the Martian surface at 540 km/h (340 mph), near terminal velocity. A day after the attempted landing, the Context Camera of NASA's MRO identified new ground markings due to the lander's impact and parachute. The crash site is about 54 km (~33.5 miles) from where the active NASA Mars rover Opportunity was at the time of the landing. On 27 October 2016, ESA released high resolution images of the crash site taken by the MRO HiRISE camera on 25 October 2016. The front heatshield, module impact site, and the rear heat-shield and parachute are identified. It is thought that the crater is about half a meter (yard) deep and it may be possible to further study this crater at a later time. On a related note, an artificially made crater was actually the goal of the THOR mission proposed under the Mars Scout program that produced Phoenix and MAVEN, the goal was sub-surface exavation. That mission was passed over, but another orbiter was able to discover naturally occurring fresh impact craters, and ice was found in them. Although the lander crashed, ESA officials declared Schiaparelli a success because it had fulfilled its primary function of testing the landing system for the ExoMars 2020 surface platform and returning telemetry data during its descent. By 20 October, the bulk of the descent data had been returned to Earth and was being analysed. Unlike the Beagle 2 lander, which was not heard from again after being released from Mars Express in 2003, the Exomars module transmitted during descent so data collected and transmitted on the way down was not lost if the spacecraft was destroyed on impact. An investigation that concluded in May 2017 revealed that, at that time, the lander deployed its parachute and then began spinning unexpectedly fast. This superfast rotation briefly saturated Schiaparelli's spin-measuring instrument, which resulted in a large attitude-estimation error by the guidance, navigation and control-system software. This resulted in the computer calculating that it was below ground level, triggering the early release of the parachute and backshell, a brief firing of the thrusters for only 3 seconds instead of 30 seconds, and the activation of the on-ground system as if Schiaparelli had landed. Images of module's crash site suggested that a fuel tank may have exploded asymmetrically in the impact. It is reported that the lander impacted the surface at about 300 km/h (83 m/s; 190 mph). Additional imaging of the site by November further confirmed the identity of the spacecraft's parts. The additional imaging was in colour and it was noted that parachute was slightly shifted. HiRISE observations of the crash site on 1 November 2016, detailing what is believed to be the main spacecrafts impact location, the lower heat shield, and upper heat shield and parachute. With this second observation, it is noted that wind seems to have shifted the parachute, and some of bright spots around the crash zone were confirmed to be from material not image noise or momentary reflections. By taking more images using a technique called super-resolution reconstruction (SRR) the resolution can be improved, and this was done for the formerly lost Beagle 2 probe. Two other benefits to more images is that is easier to discern between image noise such as cosmic ray hits and real objects, and among bright spots high albedo objects versus momentary specular reflections. Finally, with multiple images over time, movement and changes, such as the wind blowing a parachute can be observed. 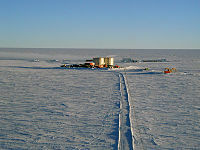 Concordia research station is another mission that supports development of an ESA human mission to Mars, supporting the Aurora Exploration Programme. Atmospheric electricity is one of the concerns for a human missions to Mars and Schiaparelli might have provided the first ever measurement of this property on Mars. INRRI was included on the InSight Mars lander. It is seen here on InSight's deck in preparation for launch. The primary mission goal was to test the landing systems, including the parachute, Doppler radar altimeter, hydrazine thrusters, etc. The secondary mission goal was scientific. The lander was to measure the wind speed and direction, humidity, pressure and surface temperature, and determine the transparency of the atmosphere. The surface science payload was called DREAMS, and was designed to conduct meteorological data for a few days after landing, as well as measure the first measurements of atmospheric static electricity on Mars. A descent camera (DECA) was included in the payload. Its captured images were to be transmitted after landing. AMELIA, COMARS+, and DECA collected data during the entry, descent, and landing for about six minutes. Much of this data was transmitted while it was descending. Although EDL portion was designed to last literally a few minutes, and the surface observations at most a few days, one instrument, INRRI, was a passive laser retro-reflector that could be used as long as possible, even decades later, for laser range-finding of the lander. INRRI was mounted to the top (zenith) side of the lander, to enable spacecraft above to target it. It weighed about 25 grams on Earth, and was contributed by the Italian Space Agency (ASI). The design used a cube corner reflector to return incoming laser light. The cubes are made of fused silica which are mounted to an aluminum support structure. INRRI was also mounted to the InSight Mars lander. Measured heat during Mars atmospheric entry. This artist's concept illustrates an electrically active dust storm on Mars, which may have produced chemicals that caused the inconclusive Viking lander life-detection experiment results. Schiaparelli was aiming to measure atmospheric electricity during the Mars dust storm season. The lander's scientific payload for the surface was the meteorological DREAMS (Dust Characterization, Risk Assessment, and Environment Analyser on the Martian Surface) package, consisting of a suite of sensors to measure the wind speed and direction (MetWind), humidity (MetHumi), pressure (MetBaro), surface temperature (MarsTem), the transparency of the atmosphere (Solar Irradiance Sensor - SIS), and atmospheric electrification (Atmospheric Relaxation and Electric-field Sensor - Micro-ARES). The institutions that contributed to the DREAMS science payload include INAF and CISAS from Italy, LATMOS from France, ESTEC from the Netherlands, FMI from Finland, and INTA from Spain. The DREAMS payload was intended to function for 2 to 8 Mars days as an environmental station for the duration of the surface mission after landing. The planned lander arrival was made to coincide with the Mars global dust storm season and collect data on a dust-loaded Mars atmosphere. DREAMS had been hoped to provide new insights into the role of electric forces on dust lifting, the mechanism that initiates dust storms. In addition, the MetHumi sensor was intended to complement MicroARES measurements with critical data about humidity, to enable scientists to better understand the dust electrification process. 3) created by ultraviolet light or atmospheric electrical processes during dust storms. DREAMS-P was a pressure sensor and DREAMS-H was for humidity;the sensors feed a single data-handling circuit board. In addition to the surface payload, a camera called DECA (Descent Camera) on the lander operated during the descent. It was intended to deliver additional context information and exact location data in the form of images. DECA is a reflight of the Visual Monitoring Camera (VMC) of the Planck and Herschel mission. Another surface experiment that was focused on dust was the Materials Adherence Experiment on the Mars Pathfinder lander, about twenty years prior to ExoMars. The Descent Camera (DECA) was intended to capture about 15 downward-looking views as it approached the surface of Mars. It was to begin acquiring images after the lower heat shield was ejected. This camera had a 60 degree field of view to capture greyscale images, to support technical knowledge of the descent. DECA was a flight spare of the visual monitoring camera of the Herschel Space Observatory and Plank mission that were launched together. The camera dimensions are 9 cm (3.5 in) squared, with a mass of 0.6 kg (1.3 lb). The DECA descent camera data were stored during descent and not meant to be relayed to Earth until after landing, so these images were lost in the crash. The purpose of this transfer delay was to protect the spacecraft and data from electrostatic discharges. DECA was designed and built in Belgium by Optique et Instruments de Précision (OIP). Because the Schiarapelli demonstrator lander transmitted during its descent, a great deal of telemetry was successfully returned. About 600 megabytes of data, amounting to about 80% of telemetry, were relayed to Earth and are being used to investigate the failure modes of the landing technology employed. Note about masses: on the Mars surface the gravity is less than on Earth, so the weight is 37% of the Earth weight. Communications UHF link with the ExoMars Trace Gas Orbiter or other compatible communication systems. This diagram compares the Trace Gas Orbiter with Schiaparelli EDM attached in its entry cone with the Mars Express orbiter. At one point, Roscosmos offered to contribute a 100 watt radioisotope thermoelectric generator (RTG) power source for the EDM lander to allow it to monitor the local surface environment for a full Martian year, but because of complex Russian export control procedures, it later opted for the use of a non-rechargeable electric battery with enough power for 2 to 8 sols. Solar panels were also considered when a longer mission (1–2 months) supported by a heavier, more complex, lander was under consideration. By the 2010s the focus was on executing a short-lived (a few days surface time) technology demonstration, with an emphasis on landing systems. Schiaparelli is unusual by carrying only non-rechargeable batteries, so its active life will be limited to only a few Martian days. This is because its primary objective is to demonstrate entry, descent and landing technologies. Schiaparelli had a UHF radio to communicate with Mars orbiters. The lander had two antennae, one on the back shell and one on the lander. When the back shell is ejected, it can transmit from the spiral antenna on body of the lander. The ExoMars TGO could also communicate with it using the UHF system. When an orbiter can communicate with the lander depends on where it is in its orbit, and not all orbiters could record or talk with lander because the globe of Mars blocks the line of sight to the lander. The ExoMars TGO could also communicate with it using the UHF system. The EDM "woke up" from hibernation about 90 minutes prior to landing, and transmitted continuously for 15 minutes prior to landing. During its landing, the EDM signal was monitored at Mars by the Mars Express orbiter, and remotely by the Giant Metrewave Radio Telescope in Pune, India. Mars Express also communicates with other landers and rovers using its Melacom communication system. The Mars Reconnaissance Orbiter (MRO) overflew the landing two hours after landing, and was available to check for signals from Schiaparelli. The ExoMars TGO could also communicate with it using the UHF system. The communication system standard at Mars is the Electra radio, in use since the arrival of the Mars Reconnaissance Orbiter in 2006. Prior to this, several orbiters used a first generation UHF relay system, including Mars Global Surveyor, Mars Odyssey, and Mars Express. Using orbiters to relay data from Mars landers and rovers is noted for its energy efficiency. On 19 October 2016 it took 9 minutes and 47 seconds for a radio transmission to travel at roughly the speed of light from Mars to Earth. So even though the radio array at Pune listened in "real time", the entire EDL sequence, which would take about 6 minutes, had already occurred even as it was being recorded as starting to enter the atmosphere. There is a tiny bit of variation because the speed of light is slowed down by the air of Mars and Earth (see Refractive index), and another factor is Time dilation, because the probe existed at a significantly different velocity and in a different gravitational field the radio station back on Earth (though relatively small). The Schiaparelli lander has two main computers, one is called the Central Terminal & Power Unit (CTPU) and housed in a warm box on top, and the other computer is called the Remote Terminal & Power Unit (RTPU) and is on the underside of the lander. Overall, the CTPU handles surface operations and the RTPU handles entry and descent, and is actually destroyed on final landing with surface because it is on the underside. When the Trace Gas Orbiter and Entry Demonstrator Module are connected, the RTPU handles the interface and sends power from the orbiter to the module. When it disconnects from the orbiter, then it must run off its internal batteries. The CTPU uses a LEON central processor, and also has RAM, PROM, and a timer. The CTPU also handles data sent to the UHF radio communication system. 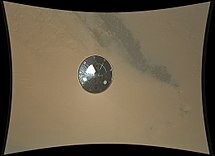 When the lander disconnects from the orbiter, it spends most of its time in a low-power hibernation mode while it coasts through space before entering the Martian atmosphere. The lander must coast through space for about 3 days by itself before landing, meanwhile the orbiter has to do a Mars orbit insertion. The DECA descent camera data is not downloaded to the computer for relay to Earth until after landing, and it is not transmitted during descent. A disk-band-gap parachute was deployed by a pyrotechnic mortar. It was tested at full scale in the largest wind tunnel in the world as part of its development. A sub-scale parachute was tested in Earth's atmosphere was conducted in 2011; it was ascended by balloon to 24.5 kilometers altitude and then released, and the pyrotechnic deployment systems was tested after a period of free-fall. On 19 October 2016 the parachute was successfully deployed on Mars. Schiaparelli module has 3 sets of three thrusters, nine total, that operate starting at about 1 km (half a mile) up in pulse mode, slowing the spacecraft from 70 to 4 m/s (252 to 14 km/h). Each of the nine engines is a CHT-400 rocket engine that can produce 400 Newtons of thrust. These rocket engines are fueled by three spherical 17.5 liter tanks holding hydrazine propellant. The tanks hold about 15–16 kilograms of hydrazine (about 34 pounds, 2.4 stones) of fuel per tank, or 46 kg overall (101 pounds or 7.24 stones). The propellant is pressurized by helium, held in a single tank containing 15.6 liters at a pressure of 170 bar (2465 psi). The thrusters shut down 1–2 meters/yards from the surface, after which the crumple zone underneath the lander handles the final stop. Data from a timer, doppler radar, and inertial measurement unit are merged in the lander's computers to control the operation of the thrusters. A possible "shutdown" moment for the next ExoMars mission was the ESA ministerial meeting in December 2016 which considered certain issues including €300 million of ExoMars funding and lessons learned from the ExoMars 2016 missions so far. One concern is the Schiapraelli module crash, as this landing system is being produced in near duplication for the ExoMars 2020 mission consisting of the ExoMars rover delivered by the instrumented ExoMars 2020 surface platform. The ExoMars team has been praised for "putting a brave face" on what happened and being positive about the EDM's very credible return on its prime mission: data about entry, descent, and landing, despite the difficulties on final landing. Also, there was the successful insertion of the TGO into Mars orbit with its large science payload. Another positive was the development of the demonstrator module as part of the overall grand plan for ExoMars, which meant that the landing technologies underwent a real-world test before carrying more valuable cargo. Just as the EDM itself was tested on Earth to gain knowledge about how it would perform on Mars, the EDM is also a test for future missions. Study of what happened is critical, as significant breakthroughs in understanding can impact the lessons learned from a mission, which in turn effects public opinion, technology, future mission design, and even the feelings of everyone involved. For example, Beagle 2 Mars lander was suspected to have undergone a high velocity impact with Mars in 2003, but when it was found on Mars intact with its panels partly deployed the EDL design was validated—but only after more than a decade. The lead developer did suffer heavy criticism and even ridicule for this failure, eventually dying from a brain hemorrhage in 2014, just a year before his spacecraft was found intact. A preliminary report on the malfunction was presented at the December 2016 ESA ministerial meeting. By December the outcome was known: ExoMars would go on being financially supported by the ESA. €436 million ($464 million) was authorized to finish the mission. After the many challenging, difficult and rewarding moments of 2016, this is a great relief and a fine result for European space exploration, ..
↑ 1.0 1.1 1.2 "Schiaparelli science package and science investigations". European Space Agency. 10 March 2016. ↑ 2.00 2.01 2.02 2.03 2.04 2.05 2.06 2.07 2.08 2.09 2.10 2.11 "ExoMars". eoPortal. European Space Agency. Retrieved 4 November 2016. ↑ 3.00 3.01 3.02 3.03 3.04 3.05 3.06 3.07 3.08 3.09 3.10 "Schiaparelli: the ExoMars Entry, Descent and Landing Demonstrator Module". European Space Agency. 2013. Retrieved 1 October 2014. ↑ 4.0 4.1 4.2 4.3 4.4 Patterson, Sean (8 November 2013). "ESA Names ExoMars Lander 'Schiaparelli'". Space Fellowship. ↑ "The European probe to Mars takes off today from Turin Airport". La Stampa. 23 December 2015. ↑ 6.0 6.1 6.2 Cull, Selby (September 2005). "Static Electricity, Toxic Dust, and the Red Planet: How NASA is Preparing to Send Humans to Mars". Journal of Young Investigators. Retrieved 4 November 2016. ↑ "The European Space Exploration Programme Aurora". European Space Agency. Retrieved 4 November 2016. ↑ 8.0 8.1 8.2 "ExoMars TGO reaches Mars orbit while EDM situation under assessment". European Space Agency. 19 October 2016. Retrieved 19 October 2016. ↑ Chang, Kenneth (21 October 2016). "Dark Spot in Mars Photo Is Probably Wreckage of European Spacecraft". The New York Times. Retrieved 21 October 2016. ↑ 10.0 10.1 10.2 Amos, Jonathan (25 November 2015). "Europe's ExoMars missions are go - finally". BBC News. Retrieved 23 October 2016. ↑ Marlaire, Ruth (14 May 2007). "A Gloomy Mars Warms Up". NASA. Retrieved 23 October 2016. ↑ 12.0 12.1 12.2 Schmadel, Lutz D. (2007). "(4062) Schiaparelli". Dictionary of Minor Planet Names – (4062) Schiaparelli. Springer Berlin Heidelberg. p. 347. doi:10.1007/978-3-540-29925-7_4041. ISBN 978-3-540-00238-3. Retrieved 4 July 2016. ↑ "MPC/MPO/MPS Archive". Minor Planet Center. Retrieved 4 July 2016. ↑ "Schiaparelli Dorsum". Gazetteer of Planetary Nomenclature, International Astronomical Union (IAU) Working Group for Planetary System Nomenclature (WGPSN). ↑ Amos, Jonathan (25 July 2009). "Science & Environment | Europe's Mars rover slips to 2018". BBC News. Retrieved 4 November 2016. ↑ "Micro-Ares, An electric field sensor for ExoMars 2016" (PDF). Meetingorganizer.copernicus.org. Retrieved 4 November 2016. ↑ 17.0 17.1 "Liftoff for Aurora: Europe's first steps to Mars, the Moon and beyond". European Space Agency. 11 October 2002. ESA PR 64-2002. ↑ "HSF The next stop (also Highlight)". European Space Agency. 28 September 2001. ↑ 19.0 19.1 19.2 19.3 19.4 "Figure 2: ExoMars Rover in stowed configuration - Scientific Figure on ResearchGate". Researchgate.net. Retrieved 4 November 2016. ↑ "Figure 2: ExoMars Rover in stowed configuration - Scientific Figure on ResearchGate". Researchgate.net. Retrieved 4 November 2016. ↑ 21.0 21.1 21.2 21.3 21.4 21.5 21.6 21.7 21.8 "Project History – ExoMars". Spaceflight101.com. Retrieved 4 November 2016. ↑ "Figure 5: Locomotion Subsystem design of MDA - Scientific Figure on ResearchGate". Researchgate.net. Retrieved 4 November 2016. ↑ "The ExoMars Instruments". European Space Agency. 1 February 2008. Archived from the original on 26 October 2012. Retrieved 8 May 2012. ↑ Amos, Jonathan (15 June 2009). "Europe's Mars mission scaled back". BBC News. ↑ "The Future Mars mission". Planets.oma.be. 15 April 2015. Retrieved 4 November 2016. ↑ "ExoMars 2016 Schiaparelli Module in Baikonur". ESA. SpaceRef. 6 January 2016. Retrieved 6 January 2016. ↑ Jonathan Amos (14 March 2016). "Mars methane mission lifts off". BBC. Retrieved 14 March 2016. ↑ Elizabeth Gibney (11 March 2016). "Mars launch to test collaboration between Europe and Russia". Nature. 531: 288–299. Bibcode:2016Natur.531..288G. doi:10.1038/nature.2016.19547. PMID 26983519. Retrieved 14 March 2016. ↑ "ExoMars on its way to solve the Red Planet's mysteries". European Space Agency. 14 March 2016. Retrieved 15 March 2016. ↑ King, Bob (24 March 2016). "ExoMars Mission Narrowly Avoids Exploding Booster". Universe Today. Retrieved 25 March 2016. ↑ 31.0 31.1 31.2 31.3 31.4 "Separate paths for ExoMars - The Schiaparelli probe will separate from its parent spacecraft on 16 October 2016". Dlr.de. 14 October 2016. Retrieved 4 November 2016. ↑ 32.0 32.1 "Live updates: ExoMars arrival and landing". European Space Agency. 19 October 2016. Retrieved 4 November 2016. ↑ "Europe's New Era of Mars Exploration" (PDF). European Space Agency. Retrieved 4 November 2016. 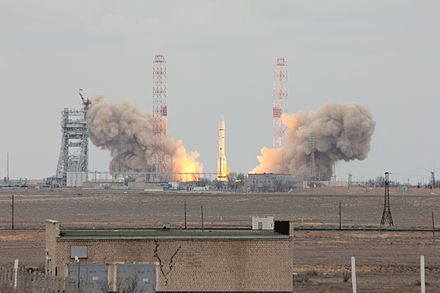 ↑ 34.0 34.1 "Mars launch to test collaboration between Europe and Russia". Nature. Bibcode:2016Natur.531..288G. doi:10.1038/nature.2016.19547. Retrieved 4 November 2016. ↑ Malik, Tariq (16 October 2016). "European Mars Lander Separates From Mothership, Takes Aim at Red Planet". Space.com. Retrieved 16 October 2016. ↑ "Schiaparelli EDM – ExoMars". Spaceflight101.com. Retrieved 4 November 2016. ↑ 37.0 37.1 37.2 Aron, Jacob (7 March 2016). "ExoMars probe set to sniff out signs of life on the Red Planet". New Scientist. Retrieved 7 March 2016. ↑ 39.0 39.1 39.2 "Separate paths for ExoMars - The Schiaparelli probe will separate from its parent spacecraft on 16 October 2016". Research in Germany. Retrieved: 31 October 2016. ↑ King, Bob (14 October 2016). "Russia and Europe are about to land a robot on Mars". Universe Today. Retrieved 4 November 2016 – via Business Insider. ↑ 41.0 41.1 "A stormy arrival for Schiaparelli?". European Space Agency. Retrieved 31 October 2016. ↑ Mahone, Glenn; Savage, Donald; Agle, D. C. (28 January 2004). "Space Shuttle Challenger Crew Memorialized on Mars". NASA. 2004-042. ↑ 43.0 43.1 43.2 "Entry, Descent and Surface Science for 2016 Mars Mission". Science Daily. 10 June 2010. ↑ 44.0 44.1 Guy Webster (5 October 2016). "News | Study Predicts Next Global Dust Storm on Mars". Jpl.nasa.gov. Retrieved 4 November 2016. ↑ "Planet Gobbling Dust Storms | Science Mission Directorate". Science.nasa.gov. Retrieved 4 November 2016. ↑ 46.0 46.1 "The hazards of landing on Mars". European Space Agency. Retrieved 4 November 2016. ↑ 47.0 47.1 47.2 47.3 47.4 47.5 "Schiaparelli: the ExoMars Entry, Descent and Landing Demonstrator Module". European Space Agency. Retrieved 4 November 2016. ↑ "Separate paths for ExoMars - The Schiaparelli probe will separate from its parent spacecraft on 16 October 2016". Dlr.de. 14 October 2016. Retrieved 4 November 2016. ↑ 49.0 49.1 49.2 Vago, J.; et al. (August 2013). "ExoMars, ESA's next step in Mars exploration" (PDF). ESA Bulletin (155). pp. 12–23. ↑ Jacqueline Ronson (17 October 2016). "How ESA's Schiaparelli Lander Will Touch Down on Mars". Inverse.com. Retrieved 4 November 2016. ↑ "Crushable Material Test". European Space Agency. 20 July 2011. Retrieved 9 January 2017. ↑ Dickinson, David (16 October 2016). "Schiaparelli Lander to Touch Down on Mars". Sky & Telescope. ↑ 53.0 53.1 Lakdawalla, Emily (19 October 2016). "Brief update: Opportunity's attempt to image Schiaparelli unsuccessful". The Planetary Society. ↑ "PIA07944: Mars Express Seen by Mars Global Surveyor". Photojournal. NASA. 19 May 2005. Retrieved 9 January 2017. ↑ "ExoMars 2016 Schiaparelli descent sequence". European Space Agency. Retrieved 4 November 2016. ↑ Sheahan, Maria (21 October 2016). "Europe's Mars probe destroyed after plunging to surface". Reuters. Retrieved 11 May 2018. ↑ 57.0 57.1 Chan, Sewell (20 October 2016). "No Signal From Mars Lander, but European Officials Declare Mission a Success". The New York Times. Retrieved 20 October 2016. ↑ 58.0 58.1 de Selding, Peter B. (20 October 2016). "Europe's ExoMars enters Mars orbit, but lander feared lost". SpaceNews. Retrieved 21 October 2016. ↑ Bauer, Markus (23 November 2016). "Schiaparelli landing investigation makes progress". European Space Agency. Retrieved 1 January 2017. 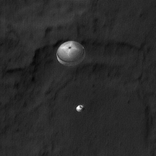 ↑ 60.0 60.1 "Mars lander smashed into ground at 540km/h after misjudging its altitude". The Guardian. Agence France-Presse. 24 November 2016. Retrieved 1 January 2017. ↑ Amos, Jonathan (21 October 2016). "Schiaparelli Mars probe's parachute 'jettisoned too early'". BBC News. Retrieved 21 October 2016. ↑ Webster, Guy (21 October 2016). "Camera on Mars Orbiter Shows Signs of Latest Mars Lander". NASA. Retrieved 24 October 2016. ↑ "Camera on Mars Orbiter Shows Signs of Latest Mars Lander". NASA. Retrieved 21 October 2016. ↑ Lakdawalla, Emily (21 October 2016). 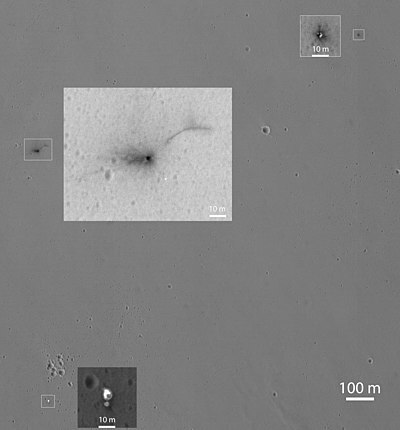 "Likely Schiaparelli crash site imaged by Mars Reconnaissance Orbiter". The Planetary Society. ↑ 65.0 65.1 65.2 65.3 65.4 "Detailed images of Schiaparelli and its descent hardware on Mars". European Space Agency. 27 October 2016. Retrieved 4 November 2016. ↑ "Detailed images of Schiaparelli and its descent hardware on Mars". Phys.org. Retrieved 4 November 2016. ↑ "Arizona State University: THOR Mission". Thor.asu.edu. Retrieved 4 November 2016. ↑ "HiRISE | Icy Craters on Mars (ESP_016954_2245)". Uahirise.org. 21 April 2010. Retrieved 4 November 2016. ↑ "ExoMars 2016 Schiaparelli descent sequence". European Space Agency. 24 February 2016. Retrieved 4 November 2016. ↑ 70.0 70.1 Wall, Mike (21 October 2016). "ExoMars '96 Percent' Successful Despite Lander Crash: ESA". Space.com. Retrieved 21 October 2016. ↑ "Schiaparelli descent data: decoding underway". European Space Agency. 20 October 2016. Retrieved 20 October 2016. ↑ "Missing Mars lander Schiaparelli may have ditched parachute too early". The Impartial Reporter. 20 October 2016. Retrieved 4 November 2016. ↑ Wall, Mike (27 May 2017). "European Mars Lander Crashed Due to Data Glitch, ESA Concludes". Space.com. ↑ Tolker-Nielsen, Toni, ed. (18 May 2017). "ExoMars 2016 - Schiaparelli Anomaly Inquiry". European Space Agency. DG-I/2017/546/TTN. ↑ "ExoMars EDM Landing Site in Meridiani Planum". HiRISE. University of Arizona. 19 October 2016. Retrieved 4 November 2016. ↑ 76.0 76.1 Bauer, Markus; Blancquaert, Thierry (3 November 2016). "Schiaparelli crash site in colour". European Space Agency. ↑ 77.0 77.1 77.2 77.3 "PIA21132: Schiaparelli Impact Site on Mars, in Color". NASA / Jet Propulsion Laboratory. 3 November 2016. Retrieved 4 November 2016. ↑ Davis, Nicola (26 April 2016). "Beagle 2: most detailed images yet of lost Mars lander revealed". The Guardian. ↑ "Mission to Mars via Antarctica". European Space Agency. 21 December 2005. Retrieved 4 November 2016. ↑ 80.0 80.1 "ExoMars 2016". National Space Science Data Center. NASA. Retrieved 23 August 2016. ↑ "ExoMars: Schiaparelli Analysis to Continue". The Planetary Society. Retrieved 4 November 2016. ↑ "Schiaparelli science package and science investigations". European Space Agency. 19 October 2016. ↑ "Retroreflector for ExoMars Schiaparelli". European Space Agency. 26 February 2016. ↑ Banerdt, W. Bruce (6 October 2016). InSight Status Report (PDF). Mars Exploration Program Analysis Group Virtual Meeting. ↑ "INRRI integrated on board ExoMars Schiaparelli". European Space Agency. Retrieved 4 November 2016. ↑ 87.0 87.1 87.2 Steigerwald, Bill (31 July 2006). "Electric Dust Storms on Mars". NASA. ↑ 88.0 88.1 "Schiaparelli science package and science investigations". European Space Agency. 19 December 2011. ↑ "Detailed images of Schiaparelli and its descent hardware on Mars". European Space Agency. 27 October 2016. ↑ "Schiaparelli Instrument Overview – ExoMars". Spaceflight101.com. Retrieved 4 November 2016. ↑ 92.0 92.1 92.2 "What to expect from Schiaparelli's camera". European Space Agency. Retrieved 22 October 2016. ↑ 93.0 93.1 "DECA – the descent camera on Schiaparelli". European Space Agency. Retrieved 4 November 2016. ↑ "Mars Reconnaissance Orbiter views Schiaparelli landing site". European Space Agency. 21 October 2016. ↑ Clark, Stephen (31 October 2016). "Mars orbiter locates Schiaparelli lander's crash site". Spaceflight Now. Retrieved 2 November 2016. ↑ "Mars: Quick Facts". NASA. Retrieved 4 November 2016. ↑ 98.0 98.1 98.2 98.3 "Schiaparelli to make Europe's second Mars landing attempt". Russianspaceweb.com. Retrieved 4 November 2016. ↑ "Heat shields for the Schiaparelli capsule". European Space Agency. 30 June 2014. ↑ 100.00 100.01 100.02 100.03 100.04 100.05 100.06 100.07 100.08 100.09 100.10 100.11 100.12 Ormston, Thomas (18 October 2016). "Listening to an Alien Landing". European Space agency. ↑ de Selding, Peter B. (5 October 2012). "Russian Export Rules Force ExoMars Mission Changes". Space News. ↑ Kane, Van (14 June 2011). "Goals of ESA's Mars Demonstration Lander". Future Planetary Exploration. ↑ "Goals of ESA's Mars Demonstration Lander". Future Planetary Exploration. 14 June 2011. ↑ Webster, Guy (17 November 2006). "NASA's Newest Mars Orbiter Passes Communications Relay Test". NASA. Retrieved 23 October 2016. ↑ 107.0 107.1 Ormston, Thomas (18 October 2016). "Listening to an alien landing". European Space Agency. ↑ Gibbs, Philip; Carlip, Steve; Koks, Don (2014) . "Is The Speed of Light Everywhere the Same?". University of California, Riverside. ↑ Toothman, Jessika. "How Do Humans age in space?". HowStuffWorks. Retrieved 24 April 2012. ↑ Lu, Ed. "Expedition 7 – Relativity". Ed's Musing from Space. NASA. Retrieved 24 April 2012. ↑ "Terma unit involved in mission critical descent on Mars". www.terma.com. Retrieved 20 December 2016. ↑ 112.0 112.1 112.2 112.3 112.4 112.5 "Schiaparelli Mars Lander (EDM)". Spaceflight101.com. Retrieved: 27 October 2016. ↑ "EDM parachute system tests". European Space Agency. Retrieved 4 November 2016. ↑ 114.0 114.1 114.2 114.3 114.4 114.5 "Preparing to land on Mars". European Space Agency. 27 March 2017. ↑ 115.0 115.1 115.2 Zak, Anatoly (22 October 2016). "Schiaparelli to make Europe's second Mars landing attempt". Russianspaceweb.com. ↑ 116.0 116.1 Clery, Daniel (25 October 2016). "Mars lander crash complicates follow-up rover in 2020". Science. ↑ 117.0 117.1 Reichhardt, Tony (20 October 2016). "ExoMars Lander Goes Silent at the Last Minute". Air & Space/Smithsonian. ↑ "Robot Mars Lander Gets Experiments for 2016 Mission". Space.com. 13 June 2011. ↑ "ExoMars EDM landing system drop tests". European Space Agency. 20 January 2012. ↑ 120.0 120.1 120.2 "Beagle 2 'was so close to Mars success'". BBC News. 11 November 2016. ↑ Childs, Martin (9 May 2014). "Professor Colin Pillinger obituary: Scientist who became the public face of 'Beagle 2', the unsuccessful British mission to land a spacecraft on Mars". The Independent. ↑ Amos, Jonathan (7 November 2016). "Key meeting to weigh Mars crash report". BBC News. Retrieved 7 November 2016. ↑ 123.0 123.1 123.2 Vila, Alixandra Caole (7 December 2016). "ExoMars Rover Gets Funding Despite Schiaparelli Mars Lander Crash". Nature World News. ↑ "ESA states approve ExoMars funding despite crash". Engineering and Technology. 2 December 2016. Wikimedia Commons has media related to Schiaparelli EDM lander. This article uses material from Schiaparelli EDM lander on Wikipedia (view authors). License under CC BY-SA 3.0.